The Quest for the Goldenrod . . .
Like some contemporary Pindar, I find myself reflecting on a recent experience that by its end had me feeling akin to Jason during his quest for the Golden Fleece. 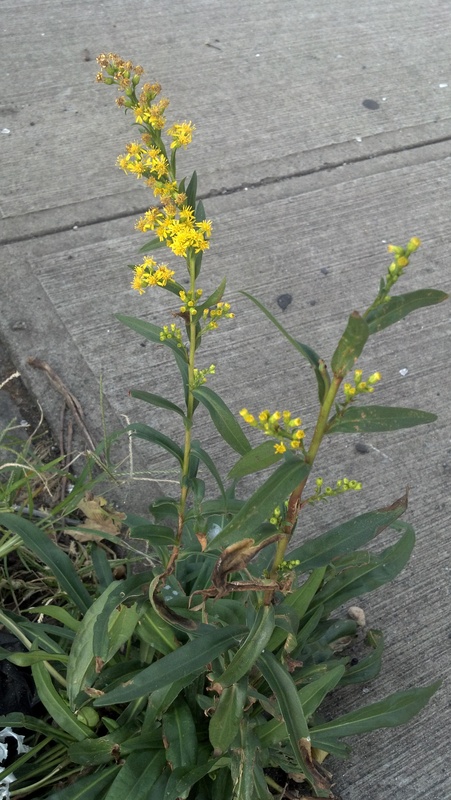 The prize in my case took the form of a species of goldenrod (genus Solidago) I discovered in bloom near the corner of 10th Avenue and West 13th Street. The quest was the search for an exact identification. Leaf shape and venation – Many goldenrod species have an aristate or ovate leaf with a dentate edge that resembles a serrated spoon, while others have more narrow lanceolate leaves, also serrated, but sometimes entire (completely smooth), often with three parallel veins, although some possess a single central one. A majority of these leaf structures and their supporting stems are hairy, but a few are glabrous (completely smooth). Some varieties sprout leaflets from the leaf axils where the primary leaf meets the stem. Flower shape – Even the casual outdoor observer is familiar with the graceful, spreading, pyramidal panicles that, like golden ostrich plumes, decorate autumn roadsides. Widespread species such as the Canada Goldenrod exhibit this flowering form. Others have a stiffer, broad, horizontal inflorescence that from a distance resembles an upturned push broom; a few standouts bloom straight and narrow, resembling a golden wand. 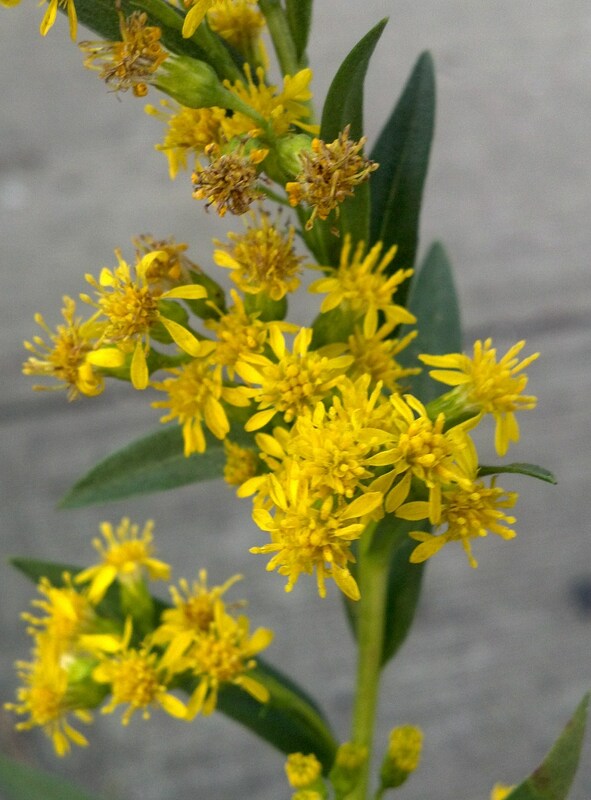 The most common species of Solidago found in the New York region include the Canada Goldenrod (Solidago canadensis), Early Goldenrod (Solidago juncea), and Late Goldenrod (Solidago altissima). During my walk home from my wildflower encounter, I assumed a comparison of my close observations with the details of one of the above would give me a quick and easy identification. The example I had photographed was easy enough to describe in words. The plant grew from a basal rosette and possessed smooth lanceolate leaves with a single central vein. The leaves and the stem were glabrous and supported a panicle of flowers that upon close inspection possessed the distinctive calyx and daisy petal appearance, which in part explains why the goldenrods are included in the vast Asteraceae family. Like Jason, I set sail – on the internet – and waded through my print resources and found a winding adventure. Each of the three common species of goldenrod possessed some, but not all, of the physical characteristics I had documented in my observations. The entire and glabrous leaves of my subject put Canada Goldenrod and Late Goldenrod out of contention. Early Goldenrod, my early favorite, has smooth leaves with a single central vein, but the example in question lacked leaflets at the leaf axils, so that species, too, was dropped from the list of candidates. Seaside Goldenrod has glabrous leaves and stems adapted to coastal salt spray conditions; it sprouts no leaflets at the leaf axils; it blooms in plumed panicles as late as November. The time, place, and physical description all fit; I believe I have found my golden fleece! Like Jason, my quest became connected to the sea, in this case the Hudson River estuary. I have often used the phrase “where nature and the city intersect” as a central element of my artistic mission statement and here again is a vivid example of just such a meeting. Manhattan has undergone a massive transformation over the last three centuries, becoming one of humanity’s most consciously constructed areas on Planet Earth, yet still there remains the natural environment that continues to dictate what adaptations will allow an organism like the goldenrod to survive and thrive. Fresh salt air still permeates the west side of the island where in autumn the goldenrod, the Seaside Goldenrod, dressed in its hardy green leaves, blooms in a mellow gold plume, even in the contemporary stone, glass, and steel shadow of the West Village.